Everything a bride to be should need to get her creative juices flowing for her special day. Butterfly themed weddings are absolutely gorgeous and are usually (although not always) spring weddings. A butterfly spring wedding is a great combination, but you can combine lots of different themes with butterflies such as a Parisian theme or a vintage theme. The butterfly wedding theme can also incorporate a lot of different color combinations as well. 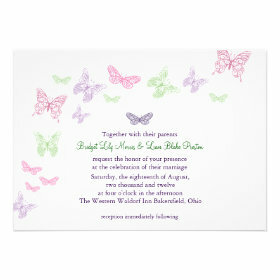 Let’s look at some of the beautiful butterfly themed wedding invitations that are available for you to choose from. An overlying theme for weddings which emerged in 2012 and has remained even hotter as we head into 2014 with no signs of slowing down is a vintage themed wedding. Vintage wedding themes (1920s inspired especially) also work well with spring weddings and as spring weddings often incorporate butterflies it’s no wonder that you could combine all three. This first design is also available in a purple tone as well as blue and I think it looks great for a vintage theme – the shade of blue in this design also says spring to be as it’s quite a revitalizing shade. If it’s not to your taste that’s okay as we have some more vintage styled butterfly wedding invitations for you to look at. These two vintage wedding invitations both incorporate butterflies, but also convey totally different emotions – I would use the first one for a more formal wedding and the second one for a slightly more casual affair. One thing it does show us is that you can use darker shades of purple and green for a spring wedding quite successfully. Paris and butterflies, how much more romantic can a wedding get? You’ll notice that the invites also have a bit of a vintage feel so you can play that up or down when you’re planning your ceremony and reception. I think the little ‘pops’ of black and white being incorporated into the design keeps it light which is in keeping for a springtime wedding. Butterfly themed weddings are usually seen as a spring time theme which is why so many people also use pastel colors. Now you certainly do not need to use pastels if getting married in spring OR if having a butterfly themed wedding, but if you want to then here’s a couple of pretty wedding invitations that you might like to use. Which of the next two butterfly wedding invitations do you prefer? There’s the real butterfly (a monarch to be precise) and then there’s the whimsical butterfly ….. I like both of these invitations and I think they really show how taking the same theme you can actually have a totally different wedding which could be why butterfly wedding themes never seem to go out of fashion. It doesn’t matter what color scheme you want to have you can still incorporate it into a butterfly wedding from the bright purples and teals to muted pastels even black can be combined with butterflies to great effect. These next invitations show off the use of strong, bright colors with a butterfly twist and I think you’ll agree it looks just as good as any of the other invites we’ve looked at. Yes, You Can Use Black in a Spring Wedding! I have read countless threads on wedding forums where people have lamented about wanting to use black or other dark colors for their spring time wedding. Now they’re right in that it’s not colors that you traditionally think of when you think of spring, but on your special day you should be able to choose your own color scheme. These next butterfly wedding invitations show how you can use black (seeing as you really can’t get any darker than black!) as a main color and still have a cool wedding theme that will work well in spring. The trick is to get a little ‘pop’ of light into the wedding this can be easily done with flowers. As you can see from these two invitations it really doesn’t need a lot of light color to really lift the black. I particularly like how the pink really pops with the black and lightens the whole theme up with the second invitation. This entry was posted in Uncategorized and tagged butterfly wedding invitations, pastel butterfly wedding invitations, spring wedding invitations, vintage butterfly wedding invites on June 29, 2015 by Lou. have to let you know that I see the running of this site as one of my jobs.